Friday Funny – a glass half hot or half cold? | Watts Up With That? Friday Funny – a glass half hot or half cold? 20 degrees C is 68 degrees F.
WOW, it is spring somewhere! That’s good news. ← More fakery from "Forecast The Facts"
This is a great post. Made me laugh. Thanks. Wow – as hot as 20 – 21 C.
Wonder how all the Brits who migrate to SE Qld survive as during most of summer 20 – 21 is our minimum night time temp ? Don’t see to many out nightbathing though. It was great (summer like) day in SW London, at least on the river between Richmond and Kingston. It was rather springlike here in the south of england today but the temperature at the start of the day was low 10 or 11 and then rose quickly and by sunset fell away again ..we have the heating on now 8pm !…..looking forward to the shale gas! Seal pups are killed either by hunters using the ice to hunt, or a lack of sea ice? …68F….and I would be freezing my feathers off! I’ve got snow on the ground in Pullman, WA, USA. I am amused that anyone thinks that 20-21 deg C is in any way ‘summery’. Although I suppose it could be a symptom the non-existent summers we’ve had for the past several years. Britain has a temperate climate, you know for sure that it’s summer there when the rain becomes warmer. Note: Please double check your spelling of the name of PhD Commenter. My news paper says Britian to boil this weekend! I live in southern England, and I’ve just checked my local forecast online(BBC/Met Office revised at 20.00 tonight). Highest forecast temps – Saturday pm is 17C, Sunday and Monday is 15C. Apparently the BBC get cooler weather forecasts than Sky now – standards must be slipping, I can’t imagine what Black will have to say about it. the UK BBC forecasters just can’t help but plug the warming meme from the top brass. all we (joe public) see on weather maps is the UK in isolation, very little of the bigger picture (Europe). when there is snow in Scotland it’s rushed over, but they like to focus on heat,no rain etc.. & drought in England SE. anybody know who pays the wages of UK weather forecasters (not just bbc) ? Funny thing that Sahara. Just this winter snow was observed on the sand where the Star Wars movie was shot. The snow started to fall overnight from Sunday to Monday, leaving a thin layer that was enough to transform the landscape from an arid desert to a glistening-white tundra…………….Tunisia has witnessed a cold snap since last week, in the north west of the country. Heavy snow in the northern towns of Thala and Kef left transport paralyzed due to blocked roads. In the town of Aïn Draham, in the governorate of Jendouba, snow reached 80 cm. Wx forecasters, including BBC, are mostly paid by the Met Office, apart from the private commercial companies. Snow may fall in the UK, especially north, before the true spring arrives. Look for a warmish summer ( plus.5C that will fade earlier than normal, then fall is liable to be quite cold. For most of europe winter 12-13 is liable to make 4 in a row with a bout of severe cold. Global temps against the 30 year mean are at -.145. See link: (http://policlimate.com/climate/ncep_cfsr_t2m_ytd_anom.png)The next 3 months will be .2 to .25 ABOVE normal but we will continue the jagged downward trend and globally as the fall resumes later in the year,and the coldest autumn since 2000 may be shaping up with the fall of the global temp as seen here, since the shift to the cold pdo link:http://policlimate.com/climate/cfsr_t2m_2011.png Next winter will bottom out colder than this past one. Better enjoy it while you can folks – this weekend in the UK might be our summer. If the Met Office forecasts another BBQ summer and it runs to recent form then all we can expect is rain. On the other hand, by the law of averages, we’re due a better summer. * For those parts of the UK at an altitude above 25 kilometers. Have a look at the following, which reaches to the north African coast and works pretty well. Now look at this and call out the hottists calling England hotter than the Sahara *and* withholding information so you can’t see. That looks like near 35C, much hotter than the all time record high for England. Yes it looks likely to be a pleasant weekend and rather likely next week, high pressure, blocking high yet again… and that is the big news, been repeated blocking, affecting the whole hemisphere. They should address that, do some real work. And apparently, even Egypt didn’t miss out on the snow. It would be fun to compare the night temperatures of South England versus the Sahara. I haven’t been to the Saraha but every desert I’ve been to got pretty cold at night. I can see the headline “Catastrophic global cooling predicted (projected) as night time Saraha desert to face freezing temperatures, even in summer”. Here in Blighty, the headline forecast for maximum temp is almost always based on central London (probably the office of the BBC’s Chairman! ), which is normally 10% warmer than the surrounding areas – UHI? I lived through the ice age drama! When I look at the climatology charts covering the last 5 million years — O BOY! — it does still look a bit scary on the cold side. I am not a skeptic. I am a supporter of a warmer Earth! The UK media has a long tradition of sensationalizing the weather. Never mind, there’s always a snow fall after the cricket season starts. I emigrated in October 1979 to SE Qld. Within two weeks I had sunstroke, and then had to endure weeks of 45C daytime temperatures. So the answer is, “just barely”. 20C sound like paradise. -3C here. Low of -8C over night with snow. Those ‘pommy’ journos are wimps. In tropical Oz, we are over 1C below average, above average rain for March and still not once down to as low as 21C… such heavenly weather. It’s the new definition of warm by the MSM/LSM. AGW/CC re-inventing the wheel stuff. They think the average Joe is stupid and won’t know the difference. “Ne’er cast a clout, ’til May be out!” Olde English saying….Never take winter clothing off until May. They use a bit of a trick in that article, as they mention the ice conditions of the previous 2 years and seem to mislead the reader into believing the ice conditions are the same now. The ice extent, as can be seen on WUWTs sea ice page, appears to be well above normal in that area. Here in the midwest these last few days we’ve had temperatures 20-30 °F hotter than Death Valley. I do believe that several days in a row of 80+ °F in the middle of March will set an all-time record for central Illinois. Kelvin Vaughan says: March 23, 2012 at 2:46 pm My news paper says Britian to boil this weekend! My newspaper says Scotland to boil some haggis this weekend. I hope I have that right, I needed to say &amp;deg; in the editor. It’s “amp;”s all the way down to the turtles. To be fair, this isn’t global warming related nonsense – it’s standard UK journalistic fare every time we get a spell of warm weather to compare us to somewhere known for its heat which is currently cooler than here. The West Coast of the US is in for another major round of Winter. It is not unthinkable that last year’s “Spring” pattern (e.g. ongoing Winter until May, ongoing Early Spring until the Solstice) may repeat. I think I have this down. I predict that it will get darker in about 3 hours. Since this proves I am good at scenarios and predictions, I am pretty sure that tomorrow will be warmer than it was in January. Sssssssooooooooo… Global warming. OMG I should be writing Mann’s research papers for him, let alone UK news science articles. I hope I have that right, I needed to say &deg; in the editor. It’s “amp;”s all the way down to the turtles. Those are just some of the ones I’ve memorized. I really hate the pointless comparisons with other random locations, half the time it’s complete BS. A couple of weeks back the Daily Mail were claiming that the UK (in other words, London and the SE) would be warmer than Greece despite the fact Athens was predicted to be exactly the same temperature. I get the feeling they use a temperature exchange system to give a slightly better rate just like the Euro. If they are not making it up they are cherry picking. During winter 2010 when we had below average temps the media here claimed it was colder than Alaska, which it was. In some parts in the south of the state. Northern Alaska however was completely different. LIKE many working couples, Anne and Russell Secombe decided to find a place by the sea where they would eventually retire to live out the rest of their lives pursuing simple pleasures. In the 1970s, the couple, now in their 80s, found it, a modest single-level brick house at 23 Illaroo Rd, Lake Cathie, a town on the NSW mid-north coast. It’s simple bliss: Anne, a retired clerk, spends time keeping up her neat garden; Russell, a retired mechanic, angles on the beach for blackfish, flathead and bream. But yesterday the Secombes’ sense of hard-earned stability collapsed when they discovered they could be among the first victims in Australia to be dispossessed of their home. Not because of any existing environmental threat, but because the local council believes climate change could pose one by the end of the century. The Met Office is financed by the Ministry of Defence, could be an agency within the MoD. I prefer the old (pre 1963) name for the MoD- the War Office. Has a far more purposeful ring to it. Bob Brown and others from his Greens Party are in the Australian Govt! THERE was rapturous applause and a fuzzy green glow at the Hobart Town Hall last night as Australian Greens leader Bob Brown took to the stage and sang for the planet. Senator Brown’s The Earth Song was like a hymn of praise and hope amid a euphoric celebration of the Tasmanian Greens’ 40th birthday…. The Greens’ hero was met with a standing ovation when he delivered the 2012 Green Oration, which called for a single global and democratic parliament. “Let us create a global democracy and parliament under the grand idea of one planet, one person, one vote, one value,” he said. Senator Brown received a standing ovation before delivering the third green oration on the theme of global – and, at times, intergalactic – democracy, addressing the party faithful as “fellow earthians”. “Surely we are not, in this crowded reality of countless other similar planets, the only thinking beings to have turned up,” he said. “Most unlikely. “So why isn’t life out there contacting us? “Maybe life has often evolved to intelligence on other planets with biospheres and every time that intelligence, when it became able to alter its environment, did so with catastrophic consequences. Senator Brown proposed that a global parliament should be formed with the question ‘Will people a hundred years from now thank us?’ inscribed above its door. He said its goals should be economy, equality, ecology and eternity. “Let us determine to bring ourselves together, settle our differences, and shape and realise our common dream for this joyride into the future,” he said. With 10 Greens sitting in federal parliament, 25 in state parliaments and more than 100 councillors around the country, the party is a far cry from the United Tasmania Group formed on March 23, 1972, after a confrontation with hydro workers. The Greens received congratulatory messages from colleagues as far away as Mongolia, while Senator Milne announced Australian Nobel Prize-winning physicist Brian Schmidt as next year’s orator. While that’s true, the Earth’s average temperature is generally agreed to be 15 degrees C or 59 degrees F.
Exceeding the “average” by 5 C or 9 F is news? Maybe Mann was right–we’re now seeing unprecedented warming! Last year at this time the high was only about 65, this year it is about 85. This is said to be higher than “normal”, which is about 75. Funny 65+85/2=75. The average is the “normal” but that doesn’t mean that most years the high is at exactly the normal. The Green Climate Fund, which is supposed to help mobilize as much as $100 billion a year to lower global greenhouse gases, is seeking a broad blanket of UN-style immunity that would shield its operations from any kind of legal process, including civil and criminal prosecution, in the countries where it operates. Well, th’ real problem is that if you get runaway global warming, you’ll hit the Planck temperature before too long. & you’ll wish you hadn’t. Wow, thanks Smokey! Now I can write œnophile correctly. What fun! BTW, all you lovely European people are welcome to keep our Canadian winter. London will not quite be as warm as Toronto has been these last few days. We reached nearly 26º C yesterday, with a ‘humidex’ reading of around 29º, while normally we’d be slipping through slush and scraping windshields, still decked in our attractive puffy winter coats. No-siree, yesterday it was sandals and short skirts at work. Whoo-hoo! But we need all the help we can get, with our ecoloon, œconimically imbecilic Premier still aggressively pushing a Green Energy plan. Darn, why is it always that soon as one posts a carefully crafted comment, the mistakes in writing suddenly leap to the eye? Is there some equivalent of “Murphy’s Law” to describe this. OF course, I meant to write “economically”. @ Joseph Bastardi, you’ve provided a synopsis of the forecast weather patterns for Europe. Does this freakishly warm weather here in Central Canada promise to lead into a warmer than normal summer? Thanks! The usual midsummer day in Britain is roughly the same as the usual midwinter day in central Florida. When the jets arriving at Disney World announce the temperature there is a robust “Oooohhh” from the passengers. Practicing climate science in Britain is roughly comparable to growing Rice in Canada. 68-74 is my comfort zone. 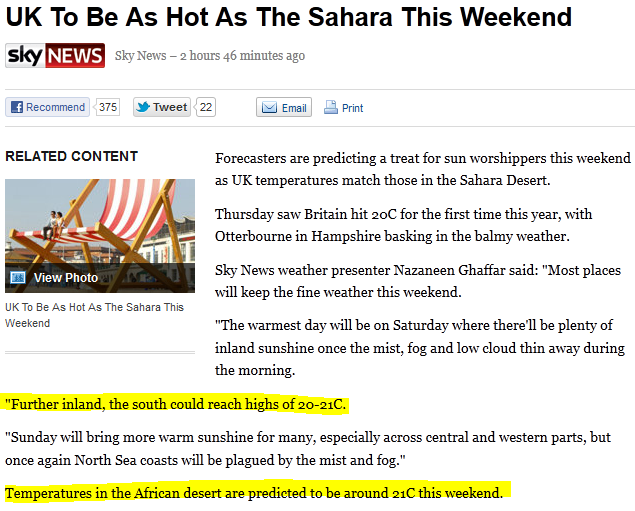 Just curious, though, are they comparing UK highs to Sahara highs or highs to lows? Yep, the plants and trees are about 1 month ahead of schedule. Temperature seems to control growth, much more than sun angle. With the thermal mass buffering of this house in Mesa Az the inside temps were 68 to 78F, with the outside being 50 to 88F, with no heat or ac use, just two ceiling fans on slow, and a box fan running on medium in the sun room/ orchid tables. They are loving it! “The authority of the civil defense … issued a warning to the civilian population not to pick up any of those pencils because they are booby traps,” he said, adding that the British and American forces were “immoral mercenaries” and “war criminals” for such behavior. “Lying is forbidden in Iraq. President Saddam Hussein will tolerate nothing but truthfulness as he is …BOOM…last line, sorry..move along folks. Baghdad Bob is NO MORE! 21 degrees celsius, isn’t that an optimum air-conditioning level ? it’s 27 in my room – I’ve had the heater on, a bit cooler in the kitchen, and around 21 outwith the building, near adelaide airport. slightly off topic but I had the good fortune of swimming with ‘ye ancient amphibious society’ (or similar), at Broughty Ferry, scotland. 12 degrees was an acceptable (swimmable) summer day, with the water around 10 degrees. funny how a few minutes later the water felt warm. amazing what you get used to. our training pool is set at 26 degrees, warm enough to work up a sweat. further off topic, but it was nice to see the girls ripping strips off sherri quammen. cdbdi’s? also nice to see the cagw labour government in queensland, notorious for it’s corruption , social and economic damage, being slaughtered in the state election. Well, according to Accuweather it will be 79F in Sabha, Libya, while here in London it will be 66F – at the moment my thermometer is reading a balmy 47F. The Ministry of Disinformation seems to be at it again. Who would have thought that there are such similarities between scorching Sarah conditions and UK Springtime. Anthony you should do a follow up on this prediction! They have complained lately of weather too cold for the beach and the rooftop pool. Unheard of cold temps! While the record March temperature of 25.6C, recorded in Mepal, Cambridgeshire, in 1968, will not be challenged, the sunshine will be welcomed by vitamin D-starved Brits. So the record is from over a half century ago and is five degrees higher … color me unimpressed. They just as well have written “as hot as Norway” in the headline. Even in Norway it reached 20C Thursday (22 March). The highest reading was 20.2C, and never ever has 20C been measured in Norway in March. The previous record for 22 March anywhere in the country was 16.0C set in 1946. The previous earliest date for 20C anywhere was 3 April. This is a classic BBC/met off ruse. They do it all the time. This place is hotter than the Sth of France or Sth Spain or the namib dessert. Just ridiculous. It’s even more hilarious when you know that the blocking high will be to the east of the uk and therefore will bring easterly winds on-shore where the sea temp is 6°C. Can’t say I fancy sunbathing at that temp. It must take these clown hours of searching to find somewhere cooler than London. Many thanks both, for your comments – most useful! This is a report by Louise Gray which I read with disbelief. At the bottom of the column is a direct to the back page weather maps which clearly show the Sahara as hotter than the UK by 10+C. I did email the Editor asking where this girl got her misinformation but got no reply. Never mind Louise has a history of baseless alarmist reports so nothing new there. The Telegraph is getting as bad as the NY Times. The Sahara is not all that far from the South of England, a good dust storm down there and I have to clean my car. I don’t know how far it carries inland, if you walk due south from my house you can make a good few hundred yards before dying when you reach the shoreline. I call it the “white cliff effect”. The high yesterday was 80F here in the central Appalachians & I can attest, it was wonderful. I can finally get rid of the double shirts & socks, the long underwear, and open the windows up. Most yrs, even after warm spells, there’ll be some snow here last of March/first of April. When I was down in VA, there was 8″ wet snow around April 7th 1987, and a whopping 30+” in extreme SW Virginia. I missed summer in the UK last year, I was in the shower. I have noticed thou; the British sun (no not the newspaper) has been out shining on all those warm days. The washing is doing nicely out there on the line and the temperature – in the sun – is 23 deg. C exactly. I’m from South Florida. 68F is cool. 98F is hot. We did hit 32F in 2010, twice. Killed the majority of Iguanas,( they’re alien anyway). My baby coconut palms froze. I was worried. They’ve recovered though, thankfully. 2010 was the first hard freeze here since 1988. Before that about 1977. We were 69F here this morning. It was so balmy, I wore a sweater. My dear Mother, A Liverpudlian, used to say as a child “It’s too hot to eat!”. When I heard this as a child, I asked her: How hot was it? Upper 70s (only Fahrenheit back then). I thought, how ridiculous, That’s not hot. I was less than 10 y.o. 20 degrees! – ooh time to roll me trousers up and put a knotted handkerchief on me head and paddle my toes in the North Sea. Headline in the Sun – accompanied by scantily clad lady in bikini – phew what a scorcher! It wouldn’t be Britain if it made sense to the rest of the world! The British have been talking about the weather since the Medieval period – “it was warmer back then you know”. Climate change is just something to blame for the stuff ups – like the wrong kind of snow. Sooner or later they’ll just go back to talking about the weather. Its GLOBAL WARMING, I tell you…. Oh, yes it is, don’t argue…. Warmest March since – like – EVAH (well, ‘since records began’, in about 1985)…. The Fast Show – Scorchio!!! I like the story. Maybe more people will come to realize that temperature is not the entirety of “climate.” You would hardly say that the UK has a climate comparable to the Sahara. Speaking as one who has lived in the Sahara, 68 degrees is cold, winter jacket time. People adapt to thier climate. Well, considering the article was for a United Kingdom audience, it makes sense that they would compare the weather there to somewhere else. If the article was for a Saharan desert audience, then maybe the other comparison would make sense. I cancelled my subscription to the Daily Telegraph months ago having bought it every day since 1956. Up until recently it could be relied upon for trustworthy unbiased reportage by educated news staff, but now the brainwashed insipid generation of reporters, ungrounded in their speciality and seemingly devoid of general knowledge to use as checks and balances to their stories, have reached the middle management levels, the paper is not worth diddly squat. Here are some airfield temps in England recorded at 15:00.
tomorrow this region of the sahara will see 86F. I caught Bill Illis’ remark in comments at another blog – posted in January of this year. He identified a sudden stratospheric warming (SSW) event. How come no one has discussed how this affects seasonal weather with unseasonal temperatures? The last such SSW event I recall was in 2008 or so. Similarly, this top-of-the atmosphere weather making event resulted in waves lasting weeks, sending pulses of cold air out from arctic and into the mid-latitudes in February. Then during March, the frigid process reversed for several weeks, resulting in temperatures here in Colorado 20F degrees above normal instead of the reverse. Finally, April reached a more typical balance. Sadly, the wikipedia page on SSW is short and sketchy, and the one link there is broken. ANTHONY AND MODs: I believe this topic deserves a threadif Bill Illis is correct! have noted the CET maximum temperature above 17°C for March. Here they are. Can you spot the global warming. Its cold in the Med at the momnent. It was much warmer in December and January. I have had to switch the heating back on. Hopefully, next week the warm weather will return since I have not moved here to be as cold, or is that as hot, as the UK. I want to be at least 10 degC warmer than the UK. 20C is what I set on the thermostat of my A/C here in the middle of the Outback. 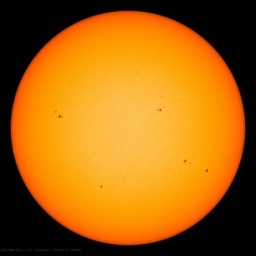 Today Sunday 25 March 2012 in Oz looked up the max temp in the UK and its 16 degrees C. Who’s pullin whos leg? The bizarre cherry picking continues. It’s currently 29C in Death Valley (2200 PT). Too extreme a location? Sticking with the number 29 i’ll randomly take Twentynine palms which was 26C yesterday. UK still considerably cooler….pfft. No doubt Neaps and Tatties too? Is London really as hot as sahara? The temperature reached 22 deg C across parts of Wales on Saturday (not a record), so that part of the forecast, at least, was correct. The article says nothing about global warming so I’m a bit puzzled by some of the posts. we’re talking about the UK being as hot as the Sahara. That was the forecast.